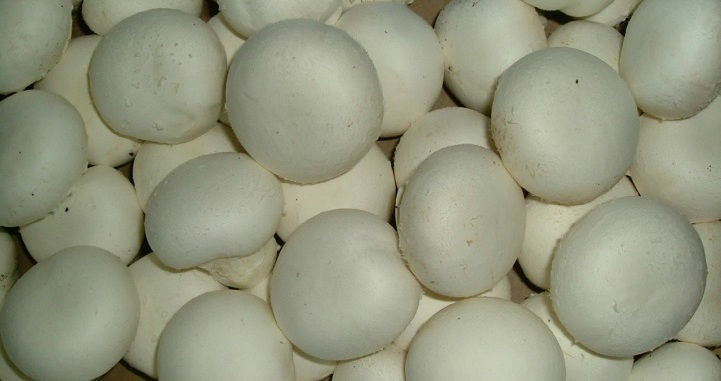 F59 is a medium size, smooth, extremely dense white mushroom with a diameter of the cap of 3 to 6 cm. This strain is capable of producing high yields of medium size and big snow-white mushrooms. It keeps its white colour in the fridge and has an outstanding long shelf life. F59 is an easy pinning, prolific strain combined with high quality mushrooms. Under correct growing conditions it does not over pin and produces high yielding third flushes. To avoid over-pinning a soft aeration is necessary and do take care that not all pins start to grow at the same moment. Evaporation is important for pin growing of later flushes. This strain has no special demand for composts but dry compost or drying at spawn run reacts negatively on the yields. For a good third flush sufficient nutrients and moisture in the compost should be available. Recommended spawning-rate 5 to 7 litres per ton of fresh compost or 8 litres through spawning. Optimal moisture content at spawning is 67 to 69% depending on the structure of the compost and the growing system. Spawn run takes 14 till 15 days because of strong mycelium growth. The optimal average substrate temperature is average 26 to 26,5°C. This strain responds favourable to a moderate delayed release supplementation mixed in the compost at spawning or before casing. It improves quality and yield mainly of the third flush. F59 is a spontaneous pin-setting strain so it is advisable to use very wet casing soil with a course structure. In a shelf system it is better not to use closed plastic underneath the compost to avoid too even flushes. Too much fine mycelium in the casing results in over-pinning and mistakes at later watering. Watering in total from casing till aeration 12 to 15 litres per m² depending on moisture content of compost and casing. Do start this watering early after casing. Ruffling creates even pinning. Therefore it is better to use Cac’ing by mixing about 400 gr. phase III compost or 150 gr. CMS per m² casing soil, in order to get more dispersed first and later flushes. At levelling take care to preserve the course structure of the casing soil. If problems with over-pinning than this strain should be flushed very gently in about 3 days from 22°C. air temp. down by 0,5°C. per day to 19°C. at a CO2 level of about 2000 ppm. This also means that aeration should be started in an early stage. At the end of pin setting no moistening or light watering because this increases the number of initiated pins. If too many pins are formed it is impossible to avoid mass pin growing by high CO2 contents or early watering. This problem has to be solved by slow aeration and short periods of high CO2 at pin setting. Also increasing the air temperature by 1°C on day 7 and 8 after the start of fresh-air may help. Keep the compost temperature at 20°C just before and at the first picking day. To get the highest yield and the best quality than, on certain main days, two times a day the biggest mushrooms has to be picked. Increasing the airtemperature to 21°C at the last picking days improves the white colour of the stems. As shown on the growing proposal increase air temperature, CO2 and relative humidity at watering at the end of the flush for re-pinning. Do not pick all the small mushrooms at the end of the first flush but leave some on a certain distance from each other. In this way you prevent a too even appearance of the second flush. Do water the casing soil at the end of the second flush with about 2 watering’s. Increase air temperature, relative humidity and CO2 in a way to raise the compost-temperature to 21°C. The next day reduce air temperature, relative humidity and CO2 . Keep reducing the air temperature very slowly for evaporation until pins of the third are pea-size.